One of the main focuses of a B2B marketing role is to generate leads for the sales team which can be converted into new business for the company and ultimately generate revenue. There are so many different channels which can be utilized to generate leads it can be overwhelming to know where to start. Below we’ve listed two of the best ways for B2B businesses to increase their lead generation. According to Chief Marketer*, email marketing is the best way for B2B marketers to generate leads. Email marketing can provide new lead information through bounce backs, which can give insight into when people have moved on from the business, or contact details if the recipient is out of the office. Email marketing reporting tools can also show you who’s clicked on your email content and by embedding your Google Analytics on your website, you can track who clicks on your emails to your website. Once you’ve found the visitor on your website – you can then monitor which pages they visit, meaning when your sales team get in contact the information they have on the visitor is as detailed as possible, increasing the chances of making a sale. Google Analytics is another great way for B2B marketers to utilize their websites, which are not always eCommerce platforms. It can be the case that B2B businesses are selling a service offering, so it can be difficult to monitor who is visiting your site when they are at the information gathering stage. Setting your Google Analytics settings to filter out major ISPs and then searching for who has visited your site, gives you an indication of who’s been visiting your site based on site traffic. This allows you to capture visitors to your website who don’t convert into inquiries. While the data is not complete, as you are only getting the person’s generic IP address, it gives you an indication to which companies are looking at your site. With so many channels available, it can feel overwhelming when looking for ways to generate new leads. 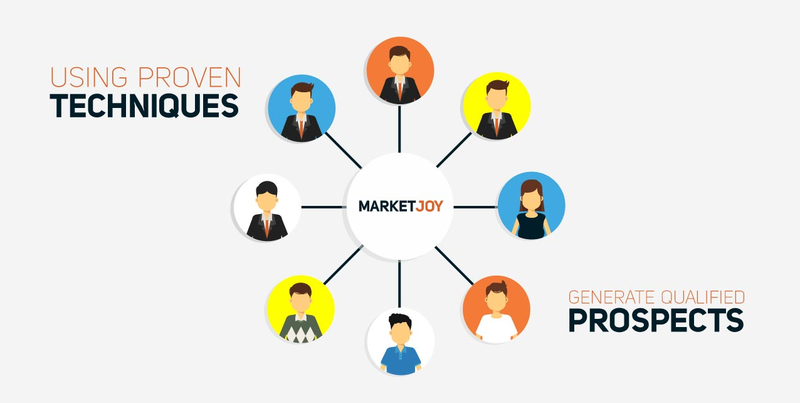 For more support, why not contact MarketJoy today to discuss your needs.